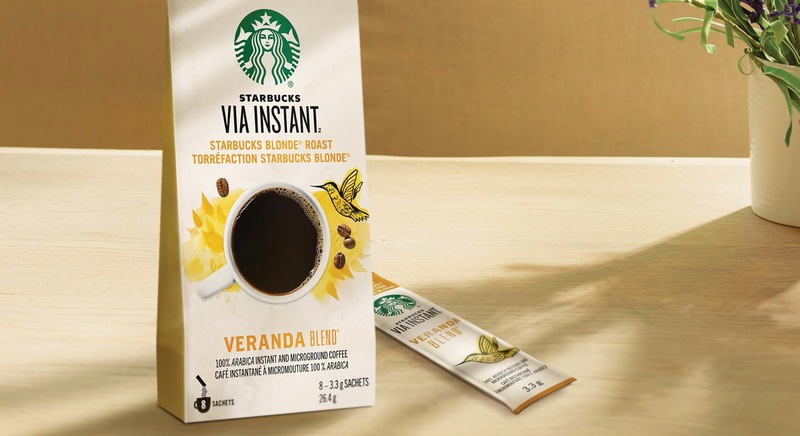 Starbucks® VIA® Instant packets give you an expertly roasted cup of coffee just like you’d enjoy in the café – in an instant. We’ve sipped coffee with farmers from Latin America for decades, sitting on their verandas, overlooking lush coffee groves. Most times it was a lightly roasted coffee like this one. It took us more than 80 tries to get it right. A blend with fine Latin American beans roasted to a glistening, dark chestnut colour. Loaded with flavour, balancing tastes of nut and cocoa, just a touch of sweetness from the roast. This coffee is our beginning, the very first blend we ever created for you back in 1971. In 2008, our master blenders and roasters created this coffee for customers who wanted a freshly brewed cup they could enjoy throughout the day. A smooth blend with Latin American beans offering subtly rich flavours of cocoa and toasted nuts, it’s perfect anytime. We’re reminded of our great love for coffee from Colombia when traveling to the coffee farms. Sitting at 2,000 metres of elevation, Colombian farms produce amazing coffee with round body, juicy tastes and a signature nutty finish that’s well worth the journey. Expertly crafted to bring out sweetness and intensity, Italian Roast – our quintessential Dark roast – has deep, full-bodied flavour and notes of caramelized sugar. Our much-loved handcrafted Vanilla Latte inspired us to create this everyday treat, featuring delicious vanilla flavour, real dairy and Starbucks® 100% arabica coffee. It’s the perfect way to experience velvety sweetness – in an instant. Our Starbucks® VIA® Caramel Latte combines rich Starbucks® coffee, dairy and luscious caramel flavour. Inspired by our signature caramel handcrafted beverages, this everyday indulgence is a celebration in your cup. Our Starbucks® VIA® Instant Cafè Mocha is an irresistible sip – the perfect union of Dutch and natural cocoa, real dairy and Starbucks® 100% arabica coffee. This everyday treat is rich and full of depth, inspired by our handcrafted Starbucks® Cafè Mocha. Just add hot water and enjoy. It’s easy to create flavourful iced coffee at home with Starbucks® VIA® Instant. Specially crafted to taste great over ice, every sip is smooth and refreshing – with the perfect amount of cane sugar. We combine notes of tangy blackberry with hints of hibiscus, sweet ginger and lemongrass, plus green, unroasted coffee beans. Light and thirst quenching, it’s the perfect pick me up. We combine notes of kaffir lime with hints of mint, cucumber and apple plus green, unroasted coffee beans. Light and thirst-quenching, it’s the perfect pick me up. We combine notes of clementine oranges with hints of cardamom, jasmine and apricot plus green, unroasted coffee beans. Light and thirst-quenching, it’s the perfect pick me up.